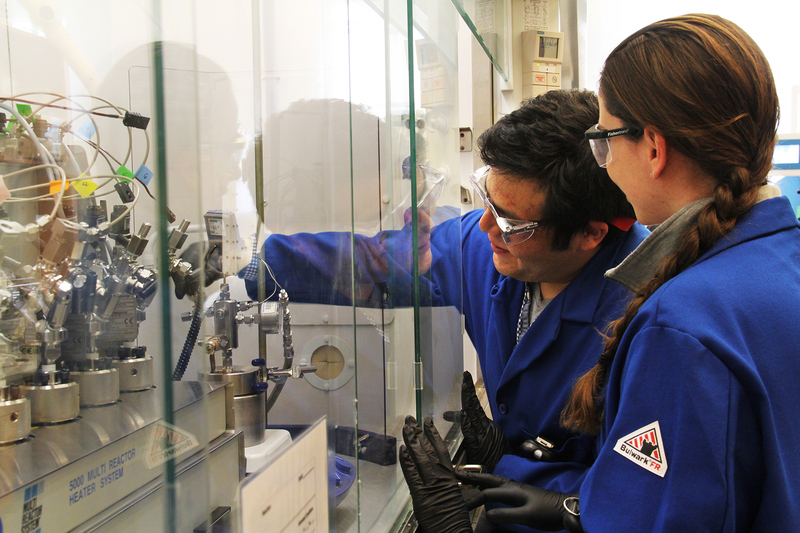 Javier Grajeda and Chrissy Roselli, both PhD students in the Department of Chemistry, set up a reactor in the catalysis lab — now a fixture at UNC thanks to its partnership with Eastman. 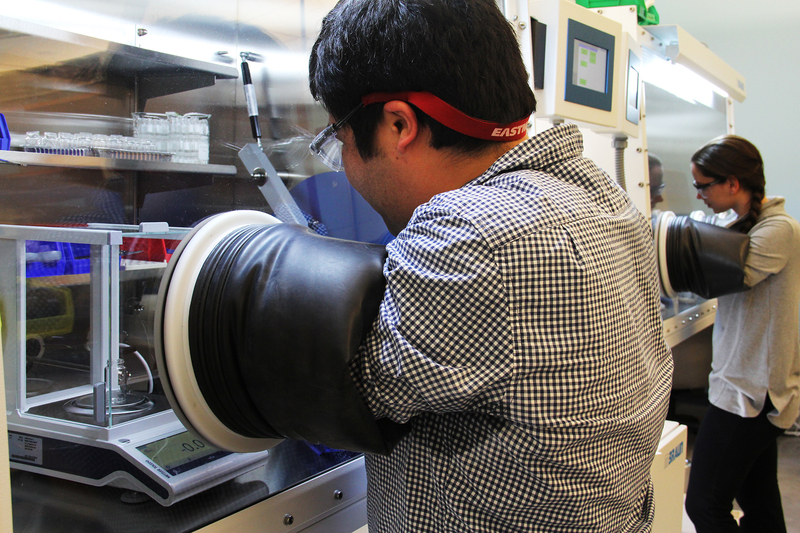 Javier Grajeda, a PhD student in the UNC Department of Chemistry, dons a pair of safety goggles attached to a red strap that reads “Eastman.” He inserts his hands into a set of black, rubber, superhero-sized gloves. His nimble fingers weigh a series of powdered metals on a scale within the square, airtight space he’s working in — an inert atmosphere glove box, which prevents contamination. After placing the powders into 18 individual vials, he passes them through an antechamber and into another box on the right, where his labmate, Chrissy Roselli, takes them off his hands. She adds a liquid solvent to dissolve the powder in each vial and places them back in the antechamber. Then, she slips her hands from the gloves, removes the vials from the biodome-like contraption, and heads to the other side of the lab, where she and Grajeda load all 18 solutions into a reactor that pressurizes them. What are they searching for? New catalysts that will speed up the production process for chemicals used within multiple industries, from agriculture to textiles to pharmaceuticals. The study of catalytic reactions has led to the development of chemical processes such as large-scale production of ammonia — used worldwide to fertilize crops — and to the invention of catalytic converters, which prevent cars from emitting dangerous amounts of carbon monoxide into the atmosphere. The catalysis lab at UNC exists thanks, in part, due to industry funding from Eastman, a global advanced materials and specialty additives company headquartered in Kingsport, Tennessee. The company has developed a variety of products from catalysts such as Eastman Tritan™ copolyester, one of the first BPA-free durable plastics on the market. Grajeda and Roselli use inert atmosphere glove boxes to keep the chemical environment sterile for experimentation. 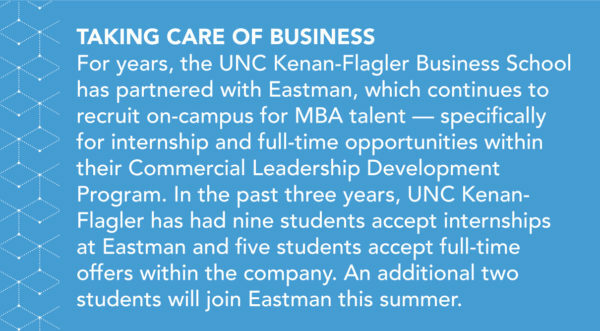 UNC’s research relationship with Eastman goes back to 2012, when the company began searching for a university partner to establish a Center of Excellence. They visited more than 50 colleges across the nation before settling on both Carolina and NC State. Today, Eastman has ongoing projects not only within the Department of Chemistry but also Applied Physical Sciences and Physics and Astronomy, as well as the UNC Gillings School of Global Public Health and the Kenan-Flagler Business School. While they were slated to invest $1.5 million over six years, they’ve already given more than $3.5 million to Carolina for nearly 20 projects — and this is only year five. Most industry-funded academic research occurs with a narrow scope. UNC chemist Alex Miller recalls his time as graduate student, when he worked on a team collaborating with another company. “A lot of industry chemical partnerships that I’ve seen in the past are really targeted at a single investigator or a small group of people focused on one problem,” he says. But Eastman’s approach is innovative. In November 2012, Eastman visited UNC to host a brainstorming session on the science they were interested in and their ongoing projects. Fellow Joe Zoeller (now retired) presented slides on an internal project involving the synthesis of acetic acid — one of the processes Eastman is known for. Since then, Eastman scientists have worked with Miller on a total of three research projects and even collaborated on an academic paper with him. This is a big deal not only for early- to mid-career researchers like Miller, but for all levels of scientists at UNC. A few years ago, Department of Chemistry Chair Jeff Johnson pitched a “wacky” solution to Eastman for an industrial process they were struggling with. Although both sides decided his idea wouldn’t be a fruitful path forward, the company was extremely receptive to Johnson’s outside-the-box approach. Four Eastman representatives live in the Triangle, two of whom — Barclay Satterfield and Dawn Mason — share an office at UNC, where they meet face-to-face with researchers and students each week. “We want boots on the ground, we want people here. Because without that you can’t build this type of relationship and maintain it,” Mason, external innovation manager, says. The company also provides financial support to recruit the next generation of scientists — like when the chemistry department hosts prospective students or brings global leaders in the field to campus for lectures. What began as a collaborative chemistry and materials science research partnership in 2013 has extended into the entire university community. Eastman now has projects within the Department of Environmental Sciences and Engineering in the UNC Gillings School of Global Public Health, three departments within the College of Arts & Sciences, and the Kenan-Flagler Business School. The company has also joined forces with UNC’s BeAM (Be A Maker) makerspace program. There are four makerspaces on campus — located within the Kenan Science Library, Murray Hall, Haynes Art Center, and Carmichael Hall — and Eastman helps with the cost of the filament, or “plastic string,” that feeds through the 40 3-D printers located in those spaces. 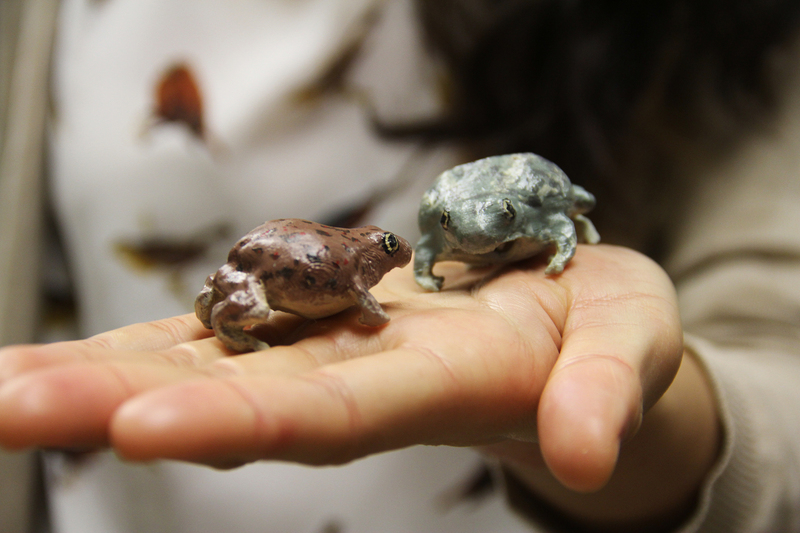 These plastic spadefoot toads were created by biology PhD student Catherine Chen, with help from the UNC makerspace team, to aid her research on their mating habits. Beyond supplying the filament for the 3-D printers, Eastman also provides hands-on training workshops for using them. This past December, the materials company hosted its first of many seminars on 3-D printing technology advancement at UNC. “Our partnership with Eastman gives us access to materials and expertise that we wouldn’t have otherwise,” says Glenn Walters, technical adviser for the makerspaces and research associate within the UNC Gillings School of Global Public Health. No matter the project, partnerships like the one UNC has with Eastman show students the work they do here is relevant in the real world. And it demonstrates UNC’s flexibility with industry partners, in general. Javier Grajeda is a PhD student in the Department of Chemistry within the UNC College of Arts & Sciences. Chrissy Roselli is a PhD student in the Department of Chemistry within the UNC College of Arts & Sciences. Joonhyung Cho is the director of business development, industry relations within the University Development Office and, specifically, the relationship manager of the Eastman partnership. Alex Miller is an assistant professor in the Department of Chemistry within the UNC College of Arts & Sciences. Joe Zoeller is a retired research fellow from Eastman. Jeff Johnson is chair of and the A. Ronald Gallant Distinguished Professor in the Department of Chemistry within the UNC College of Arts & Sciences. Dawn Mason is the external innovation manager at Eastman. Barclay Satterfield is the Eastman Innovation Center leader and principal chemical engineer at Eastman. Steve Wright is a technology fellow within the Corporate Technology Division at Eastman. He is also a UNC alumnus within the Department of Chemistry's PhD program. Glenn Walters is the technical adviser for the BeAM makerspace program. He is also a research associate for the Department of Environmental Sciences and Engineering (ESE) and director of the ESE Design Center within the UNC Gillings School of Global Public Health. CeeGee McCord is the director of global public and community affairs for the Eastman Foundation. 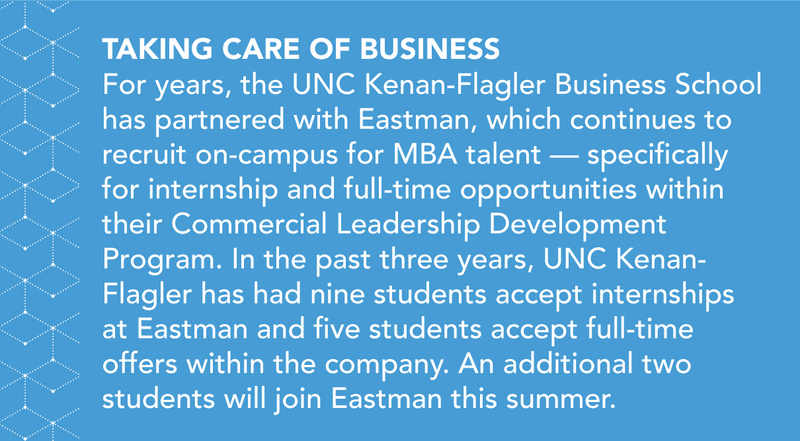 UNC-Chapel Hill’s partnership with Eastman is managed by the Office of Corporate & Foundation Relations. The office represents the university’s academic priorities through its strategic cultivation, solicitation, and stewardship of corporations, foundations, and industries to maximize their investment in Carolina. For more information, please contact the office’s director of business development, industry relations, Joonhyung Cho. This entry was posted in Creativity, Invention. Bookmark the permalink.